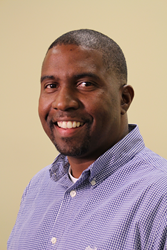 Vincent Tompkins of Lula, MS has been selected as an NBCC MFP Fellow. The NBCC Foundation, an affiliate of the National Board for Certified Counselors (NBCC), recently selected Vincent Tompkins of Lula, MS, for the National Board for Certified Counselors Minority Fellowship Program (NBCC MFP). As an NBCC MFP Fellow, Mr. Tompkins will receive funding and training to support his education and facilitate his service to underserved minority populations. The NBCC MFP is made possible by a grant awarded to NBCC by the Substance Abuse and Mental Health Services Administration (SAMHSA) in August 2012. The Foundation is contracted by NBCC to administer the NBCC MFP, as well as training and collaboration activities, such as webinars, that are open to all National Certified Counselors. The goal of the program is to strengthen the infrastructure that engages diverse individuals in counseling and increases the number of professional counselors providing effective, culturally competent services to underserved populations. The NBCC MFP will distribute $20,000 education awards to Mr. Tompkins and the 21 other doctoral-level counseling students selected to receive the fellowship award. Vincent Tompkins is a graduate of Delta State University in Cleveland, Mississippi, and is currently a mental health therapist at Mid-South Health Systems in Forrest City, Arkansas. He is a National Certified Counselor (NCC), Distance Credentialed Counselor (DCC), Approved Clinical Supervisor (ACS) and Board Certified Coach (BCC), and a licensed professional counselor in the states of Mississippi and Arkansas. He has a private practice in Clarksdale, Mississippi, where he practices counseling and coaching and provides consultation for an at-risk youth program. Mr. Tompkins has a passion for counseling and helping adolescents and adults to embrace their dreams, establish their career goals and maximize their potential. The Foundation plans to open the next NBCC MFP application period in November 2014. To learn more about the NBCC MFP and its fellows, please visit our website. The NBCC Foundation is the nonprofit affiliate of the National Board for Certified Counselors (NBCC), based in Greensboro, North Carolina. NBCC is the nation’s premier professional certification board devoted to credentialing counselors who meet standards for the general and specialty practices of professional counseling. Currently, there are more than 52,000 National Certified Counselors (NCCs) in the United States and more than 50 countries. The Foundation’s mission is to leverage the power of counseling by strategically focusing resources for positive change.